Hey Guys, it has been a while. Life is very busy. I started my journey at Grand Canyon University as a music major. Being here, I have learned that little reminders of daily self-love constantly show up. Every day, I am having to remind myself of my ability and of my good mind and affirm myself that I can make something really good out of life through my talents. My success in life is not measured by what I have or what I have done. My success comes from who I am and the ones who love me for it! Happiness keeps me sweet. Trials make me strong. Sorrows keep me human. Failure keeps me humble. Success makes me eager, and positivity keeps me going. I’m glad my journey through self-love allows me to pause and remember that I am here. I serve a purpose. Seeing little reminders in our self-love journey are crucial. Sometimes we can stray from the journey. I know that to be true. It’s not always intentional, but we get busy and forget to take time for ourselves. I’m preparing to get ready for midterms in a short few days. I can’t believe summer is gone, but it has been full of so much growth for me. I have been learning this summer that self-love requires me to use my talents, time and gifts to better the world. For me personally, I do that through music. I want to use my music to fix the brokenness, the hurt, the left behind, and those who just needs tools to cope. This summer has been filled with little reminders, like how I should be using my gifts, time and talents, the importance of friendships and practicing self-love daily. My great adventure to Phoenix for example, I arrived here and everything was going astray. My old self would totally have just freaked out and ran away, but I decided that I wanted to continue to pursue my dreams. It was the best little reminder that I don’t have to run to old behaviors every time something bad happens. Instead, I’m constantly practicing self-love and remaining in communication with others around me. I am not alone. Through self-love, my higher power and many supporters around, I’m living my dreams a little more everyday. I have missed you Self-Love Warriors, very much. So what little reminder do you need today? Do you need to go for a walk, watch the stars, paint your nails, hangout with friends? Little reminders to just breathe, go with the flow and do what you love and be with who you love. 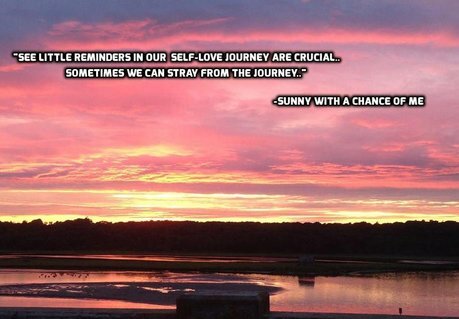 Gallery | This entry was posted in Self-Love and tagged Lila Hartage, Little Reminders by Lila Hartage, little reminders of self-love, self-love, self-love journey, self-love warrior, self-love writing, Sunny With a chance of me. Bookmark the permalink. I often remind myself not to get sucked into the habit of repeating my previous bad habits. When I succeed and do open myself up to choosing positive action, I love myself even more. Gold stars for both of us!